Cars with independent network connectivity are upon us. Just last week we posted about the 2015 Audi A3 which will come with 4G LTE connectivity. 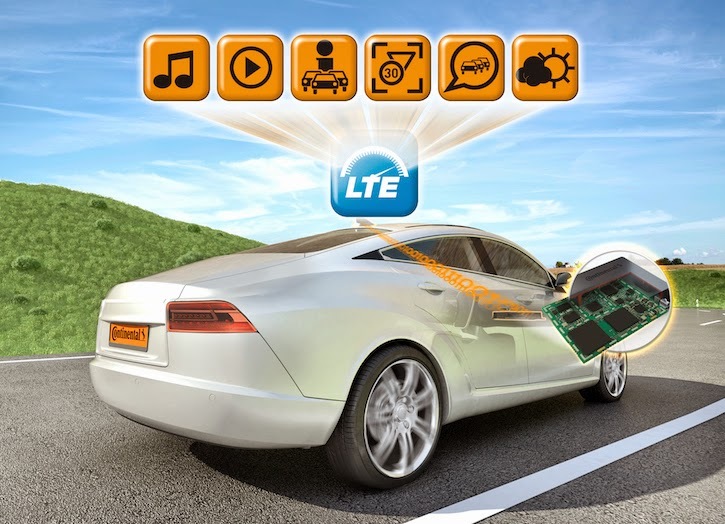 Now there's news that a German automotive equipment supplier called Continental is readying LTE modules made for cars. The new telematics module will bring 100Mbps LTE data connections to cars. Bandwidth like that can be used for all car technology functionality like navigation and entertainment media. This will ensure drivers keep their hands off their smartphones which are currently being widely used to provide those functions. The LTE module is different from mobile service providers like AT&T and T-Mobile which are already providing SIM cards for cars and pushing for the technology to be adapted by more carmakers. The US Government is already asking carmakers to develop vehicle-to-vehicle communication systems (V2V) which could help reduce traffic accidents. Along with V2V there's vehicles-to-infrastructure (V2I) technology that may get developed. For example, vehicles communicating with traffic lights or highway speed limit indicators. According to Continental, its new module can accommodate V2V and V2I technology too. The module is scheduled to be available for vehicle mass production from early 2015.